Laird Hunt's Neverhome (reviewed below) is the story of an unforgettable woman, Ash Thompson, who joins the Union army during the Civil War. Her comrades know Ash as "a slight man, handy with a rifle." Hunt uses Ash's powerful voice to make the nightmare of the war tangible: "You couldn't see the colors, you would have thought it was a mirror. Like the central job of it was we were fixing to fire at ourselves." We spoke to Hunt about his remarkable novel, and asked about Ash's precise, vivid voice: she "sewed at it until the stitch stayed shut"; "An inch or two before dawn"; "she was fierce happy." Hunt said, "I was very careful not to write her voice the way voices were reproduced in fiction of that time, so I read numerous journals and letters from the Civil War period. I also used some of my grandmother's turns of phrase when she reminisced about her grandparents. She was born on an Indiana farm; I lived there with my mother through my adolescence. She informed my ideas of Ash's mother--a totemic figure, fiercely present." As is Ash. About a man writing about a woman, he said: "I had a chance to be flexible and inventive--I'm a stranger in a strange land. And I started to hit my stride when I began investigating these central issues of our national psyche, which are still unfurling." Video: "Neil Gaiman Answers Top Book Club Questions" for The Ocean at the End of the Lane. "Sunday sweets for book lovers": Cake Wrecks featured "some books we can really sink our teeth into." The Guardian offered the helpful guide: "How to tell you're reading a Gothic novel--in pictures." "Turkish delight is real candy you can make yourself." Mental Floss highlighted "16 facts about The Lion, the Witch and the Wardrobe." "Get ready to read down memory lane," Buzzfeed observed in highlighting "27 books parents should read to their kids before they grow up." 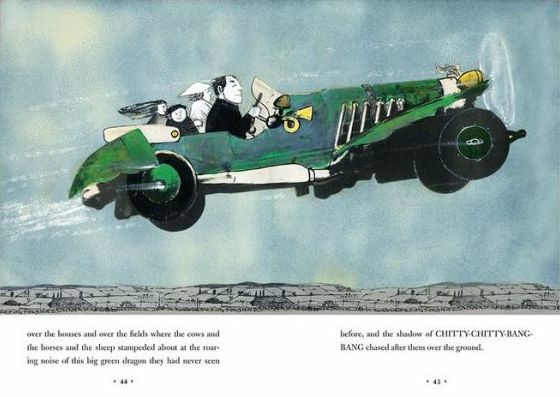 John Burningham was offered the opportunity to illustrate Sir Ian Fleming's Chitty Chitty Bang Bang (Jonathan Cape, 1964) almost immediately after winning the Kate Greenaway Medal--England's most prestigious accolade for an illustrated book for children--for his first picture book, Borka (Jonathan Cape, 1963). Fleming had already published his books about James Bond. Here Burningham reflects on their collaboration and on the 50th anniversary publication, recently released by Candlewick Press. 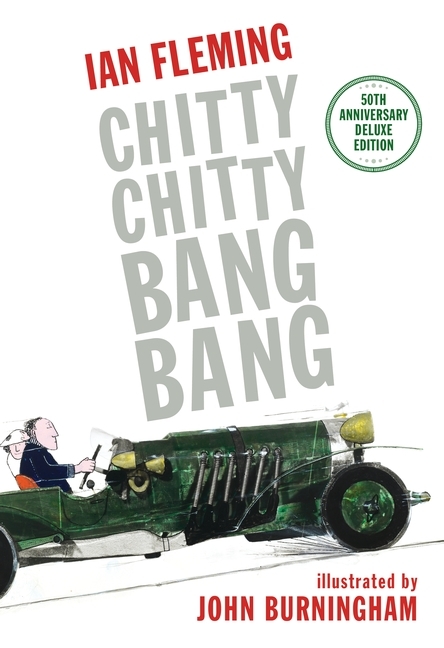 How did the manuscript for Chitty Chitty Bang Bang come to you? I was asked if I wanted to do it, and of course I said, "Yes, I'd love to." I can't remember whether I had to submit an example of my work, I just remember being delighted to do it. It was a very prestigious piece of work. [Fleming] died just before the publication of Chitty Chitty Bang Bang, which was a pity. He was not particularly old, but he wasn't well at that time of his life. Did you ever meet Sir Ian Fleming? I did meet him briefly. When I had finished the books [originally published as a trio], I met him in the office of Jonathan Cape. There was only one thing he wanted me to change, and that was to add a mark to a tobacco shop in Paris. The shops are called "Tabac" in France. They have a marker, a red-and-white stripe pole, or used to have, that came out at the top, and he wanted that put into one of the scenes in Paris. I look at the drawings, and I'm never sure whether I did it or not. If he hadn't liked something, he would have told you. Prior to this project, you had written and illustrated your own work, Borka. 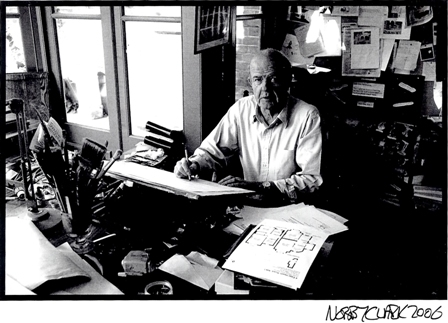 Did illustrating Fleming's work pose new challenges for you? Yes, but at the same time, you're halfway there, aren't you? You don't have that problem of working out the story as well as doing the drawings. I haven't done a lot of illustration [for other authors] in my time. Wind in the Willows is about the only other one I've done. What attracted you to the project as an artist? It's a lovely challenge to make a flying car. It was a great adventure story for kids. What materials did you use for the artwork? They have so much spontaneity. I made a model of the car, which I hung up in my studio, then had it photographed for more different kinds of angles, and then added the background. They're a mixture. The model was the way I decided to do it. I used the photographs as the basis for the illustration. You painted right on top of the photographs? Yes. The first picture--with the car taking off over the traffic--that is probably a photograph of the car, which I then put the figures in afterwards, and did all that smoke and stuff. I've always used all kinds of stuff in pictures, and I still do. We love the full-spread image of the car spilling Joe the Monster, Soapy Sam and Man-Mountain Fink onto the road. That's the car being photographed, and it's hanging on fishing line. You move the car at speed toward the camera, so the camera records that sort of movement. The villains spilling I drew afterwards. I like certain bits of that image. The movement of the villains is not quite right for the speed of the car. And the black-and-white images? Are those pen-and-inks and watercolor? It's probably pen and ink and then in-fill with watercolor. I forgot to put the mouth in for the mother and the boy, I'm noticing. What about siblings Jeremy and Jemima--did you spend time thinking about what they'd look like? I didn't think they were that important, honestly. It's absolutely adventure-packed, that story. The way that Fleming does it, there's never a dull moment. There's always something happening. Are you pleased with this new edition? This is a compilation of the three original books. The reproduction is better than the original, and that is because it was re-photographed. We didn't want to send the artwork out to China, or wherever. The facilities now for reproduction are superior than they were when this book was first brought out. You've got more detail and it's a better production. Union soldier Ash Thompson's comrades in arms know him as a slight man, handy with a rifle. If they looked more closely, they'd see that Ash is really a young woman. Constance Thompson left her soft-natured husband, Bartholomew, to mind their farm while she marched off to the Civil War, reasoning that she'd have a better chance of survival than he. As the war sweeps Ash across the countryside through the blood and stink of battle, her grit, good sense and bravery save her again and again. However, while most of her story feels true, Ash occasionally glosses over a conversation or seems to omit a small detail in the telling, giving rise to questions about who and what she is or is not: devoted wife, patriot, adventurer or madwoman. Is she defending the honor of a beloved who would not make a fine soldier or escaping some manner of marital unrest? Discover: A brave and unforgettable soldier in the Civil War--a woman whose husband remains at home. After his zany first novel, Busy Monsters, William Giraldi has gone over to the dark side with his Cormac McCarthy-like Hold the Dark, a brutal revenge tale. In the small, isolated town of Keelut, Alaska, bad things are happening. Three children have been taken by wolves, never to be seen again--at least, that's what the villagers and Medora Slone believe. Medora's six-year-old son, Bailey, was taken, and after a fruitless search in the rough backcountry, she seeks help from Russell Core. He's a 60-year-old nature writer and wolf expert who loves wolves for their fierce will to survive. She writes him a letter: "Come and kill it to help me." Russell is willing to help, but he knows wolves kill and eat children rarely, only if they are starving. When he meets Medora, "her face did not fit... she seemed not of this place at all." He sets off to track the wolf but feels that something else is going on. Giraldi then paints a clearer picture of this mysterious woman by describing her husband, Vernon, who's in the military, killing fighters in some unspecified country until he's wounded and sent home. Discover: A dark, disturbing novel about the roots of evil and the paradoxical truths it can reveal. A life spent at home with one's child can bring intense joy... but at what cost? In Siobhan Adcock's debut novel, The Barter, two women--one on a farm in 1902 and the other in present-day Texas--are confronted with this question as they struggle to find fulfillment in their quiet but far-from-tranquil lives. The former, Rebecca, left a comfortable life in the city to help her hardworking husband manage a farm. Despite her admiration for him, there is a poisonous strain of resentment between them that neither party quite understands. The latter, Bridget, left her career as an attorney to care for her baby. While her husband works, she faces a truly inexplicable threat: a ghost, amorphous and smelling of old earth, roams silently through her suburban home. Bridget and her baby are the only witnesses to the haunting, which raises questions about the struggling mother's sanity. Discover: A thriller about two mothers, separated by more than a century, whose challenges range from loneliness to a supernatural threats. Among crime-novel aficionados, it's generally accepted that Ted Lewis established the noir school of writing in Britain, and one novel in particular got it going: Get Carter. It was first published in 1970 (as Jack's Return Home) and was made into a 1971 film adaptation. Starring Michael Caine as Carter and directed by Mike Hodges (his first film), Get Carter quickly became a cult hit. As Hodges writes in his foreword to this welcomed reissue from newly established Syndicate Books, the novel has an "enigmatic" style, and even though set in England and written by an Englishman, it's "atypically English." Jack Carter returns to the northern mill town of his youth for the first time in eight years for his brother's funeral. It seems Frank crashed his car while drunk--but he didn't drink, so Carter's not buying it. Carter, who's a gangster in London, is a ruthless avenging angel in this gritty, dark and quite violent thriller. Even though his feelings for home and family aren't strong, he still feels the need to seek revenge. It's in his blood. Discover: A reprint of a classic noir story about an antihero deluxe by one of Britain's best crime writers. Lovers of high-action thrillers will be delighted to discover Angel Killer by Andrew Mayne, who has used his extensive experience as a professional illusionist as the basis for an unusual and highly entertaining detective story. Jessica Blackwood is an FBI agent who spends her time trying to keep her head down and do as much good as she can. Jessica was born into a family of magicians, and spent the first two decades of her life onstage working to perfect the family craft while dodging her mercurial grandfather's moods. She left the industry and cut off all ties with her family when an escape attempt went awry and nearly ended her life. Now, Jessica is forced to acknowledge her unusual skills when a murderer known as the Warlock stages a series of ghoulish, impossible-seeming crimes. Jessica is able to reveal that what at first appears to be the work of an actual sorcerer is really just a devious and elaborate combination of illusions, much like those she used many years ago. As the FBI draws closer to the killer, however, Jessica begins to suspect that she herself may be in grave danger. Angel Killer is tightly plotted and fast-paced, with a compelling protagonist, a ghastly villain and even a dashing and dangerous antihero in the form of Jessica's brilliant but deranged ex-boyfriend, Damian. By the end of the book, the Warlock's identity is revealed, but Mayne entices readers with the possibility of a future confrontation between Jessica and an even greater evil. --Emma Page, bookseller at Island Books in Mercer Island, Wash. Discover: A bestselling self-published thriller from a TV illusionist, available for the first time from a major publishing house. In a frighteningly plausible near future, climate change and overconsumption have led to a devastating drought; the crumbling cities of the desiccated West Coast are sealed off from the rest of the country, receiving meager help from the federal government. In once-green Portland, Ore., water is severely rationed, though some have found ways to hoard it or bypass the regulations. One night, unemployed barista Renee Gorski helps hijack a government water truck headed to the wealthy neighborhoods and distributes the bounty to those in need. Her impulsive act, caught on camera, earns her the sobriquet Maid Marian and leads to more significant activism: she declares a single neighborhood to be a sovereign country, which secedes from the city and operates on utopian sharing ideals. With nods to various activist movements, including Occupy, the charismatic Marian builds her community one neighbor at a time, supported by her acolyte army, the Green Rangers. Marian finds it's not easy to keep her people fed, hydrated, happy and motivated, but she's driven to persevere--to the detriment of her relationship with her supportive boyfriend, Zach, who remains in Portland. As her legend spreads and her territory grows, Marian's idealism is compromised in the face of violent opposition from the City of Portland, led by struggling mayor Brandon Bartlett (who'd really rather play videogames than deal with the conflict) and the National Guard. Discover: A group of idealists, led by a charismatic young woman, struggle to remake society in postapocalyptic Portland, Ore.
"We feel a frustration with the way politics are handled and the way politics are handled within the media.... The appeal of doing the show is that it's cathartic," says Jon Stewart about his stint hosting the hugely popular Daily Show, which has broken new ground in the world of comedy talk shows since he took the reins in 1999. Biographer Lisa Rogak (who has also profiled Stephen Colbert, Shel Silverstein and Stephen King) highlights Stewart's bumpy rise to this catharsis. She touches on his family life, but Angry Optimist focuses primarily on Stewart's career in comedy, from the side jobs that supported him to his stand-up career, TV appearances, film roles, books and even Oscar-hosting duty. Including both humorous and serious insights from colleagues, Rogak presents a detailed picture of the Comedy Central show, revealing exhausting writing schedules, dogs in the office, interns running around at top speed and people who aren't particularly enamored with the host. Giving voice to Stewart's naysayers allows Rogak to explore a broader view of the "high-functioning hermit," who is rarely seen in public outside of work. Discover: An inside look at the man who changed the face of comedy talk shows. NPR's Fresh Air book critic Maureen Corrigan (Leave Me Alone, I'm Reading) didn't like The Great Gatsby the first time she read it for school when she was a teenager. But after teaching and lecturing about it for decades, her enthusiasm and ardent passion for F. Scott Fitzgerald's classic novel infuse So We Read On (a title that spins off the novel's famous closing line). Corrigan argues that "if there is such an animal [as the Great American Novel], then The Great Gatsby is it." She feels that many readers who encounter Gatsby for the first time in high school or even middle school are too young and inexperienced to appreciate it fully; many will unfortunately and unnecessarily form a dislike for a book that they might learn to love later in life. She also debunks a widespread interpretation of the novel as a grand, decadent celebration of materialistic American culture; it is, rather, an enormously subtle criticism of a class system that Fitzgerald felt had snubbed him. Discover: An impassioned guide to The Great Gatsby by a highly qualified and devoted fan. In his essay "How to Explore Like a Real Victorian Adventurer," Monte Reel writes of explorer Richard F. Burton, "He was an enthusiastic amateur in an era when the word wasn't a slur." That, perhaps, is the best encapsulation of Read Harder's ethos. In this compilation, culled from the last five years of the Believer magazine's pages, the disparate topics lend themselves to discovery; here, the reader is the amateur, and the pieces demand investigation and wonderment, no matter how far-flung their subject matter. The word "disparate" isn't hyperbolic. Read Harder covers an anatomical and historical analysis of beavers, Nick Hornby's remembrance of the World's Weirdest Job (fetching purebred puppies and castle architectural plans for a Korean company's English headquarters), a dissection of the clothing store Hollister's sensory marketing (particularly with regard to stoners), and a glimpse at a man who purposely seeks snake bites to gain superhuman immunity. The collection's most winsome quality--a rare one, in contemporary reportage--is the sheer delight it offers through the act of consumption. Each discovery feels revelatory, and the writers' zeal is as contagious as their curiosity. Readers may not set out to know the psychological innuendos of V.C. Andrews's Flowers in the Attic, but Sara Gran and Megan Abbott's "Dark Family" could easily convince them to seek out the author's entire unsettling oeuvre. Discover: A quirky, edifying anthology from the best and brightest voices in contemporary nonfiction. Raised as a Southern Baptist, Christian Wiman lost his religion early on, then wrote several fine books of poetry, became editor of Poetry magazine and learned he had a rare, incurable form of cancer. As he described in his popular memoir, My Bright Abyss, he returned to faith, to prayer. He felt his strong spiritual hunger fulfilled--and his cancer hasn't killed him yet. In his fourth poetry collection, Once in the West, Wiman explores the "hard horizonless country" of his West Texas roots, his religion, his family and the joy of being alive. Here, he proves himself to be a writer who can show us the world poetically from a metaphysical, mystical, religious viewpoint. His poetry can sustain, lift up, support--it is sustenance for the soul. 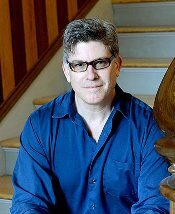 His is an intense, intimate poetry, employing surprising meter, rhyme and word juxtaposition to share ideas, opinions and memories. In "Winterlude," he confesses to the reader his experience with cancer, the pain and the suffering. "Painlady leaning into pain as every day she does:/ this time it's mine, this time my spine's/ rivering new forms of formlessness:/ lava crawling creaturely through my jaw,/ one shoulder shot through with shineless light/ only the unliving could see by." Discover: Poems that reveal how to experience and confront the fear of death and the sustenance of a faith in something greater. The team behind And the Soldiers Sang delves deeply into another chapter of World War I with this beautiful, bittersweet tribute to the men nicknamed the Harlem Hellfighters by the Germans "for their tenacity." These 2,000 men were as talented with their instruments--playing jazz, blues and ragtime, led by "Big Jim" Reese Europe--as they were skilled on the battlefield. The exquisitely designed book traces their journey from recruitment in April 1916 through to Big Jim's tragic death in May 1919, and portrays the mood in the United States as latecomer to the Great War, and segregation in America and how it followed the soldiers overseas. The men are assigned to menial labor in France, yet perform music for the privileged. In March 1918, they're finally sent to fight, portrayed in Gary Kelley's gorgeous re-imagining of Delacroix's Liberty Leading the People (1830), with a valiant woman holding the French flag high as the Harlem Hellfighters race into battle. Discover: A beautiful, haunting depiction of the 2,000 men who were valued contributors to the Allied Forces and returned home to sorrow. Andrew Smith (Winger; Grasshopper Jungle) pens a phenomenal novel about life's many detours, told in the unforgettable voice of an epileptic teenager with heterochromatic eyes (one blue, one green) and a strange history. When 16-year-old Finn Easton was seven, a dead horse being transported to a rendering plant fell "one hundred sideways miles" off a bridge and landed on Finn and his mother. The impact broke Finn's back and killed his mother. His epilepsy, which he may grow out of, is a "souvenir" of the accident, and if he does grow out of it, he suspects he may miss the way the seizures empty the words out of his head. Finn measures the world in miles instead of minutes, because he believes "distance is more important than time." His crush, Julia Bishop, just moved from Chicago to Finn's Southern California town. 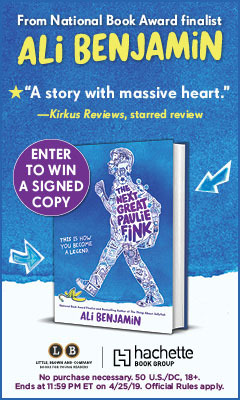 Julia loves Finn back, which makes it devastating for Finn when Julia must return to Chicago--the scene of a tragedy that makes Finn wish he "could push the world back all those miles with my bare hands and make it change direction," even if it means they'd never have met. Discover: A 16-year-old epileptic whose life was changed when a dead horse fell onto him and his mother.